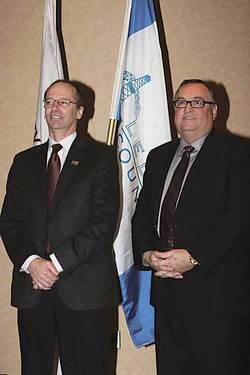 Jan. 23, 2013 7:00 p.m.
Leduc County Mayor John Whaley (on left) and Leduc Countty Mayor Greg Krischke both gave very positive updates on the state of their respective areas of governance at the Leduc Regional Chamber Luncheon on January 11th. The first Leduc Regional Chamber luncheon of the year was overflowing with attendees and area representatives to hear the double header of Leduc County Mayor John Whaley and Leduc City Mayor Greg Krischke speak on the state of their respective areas. Mayor Whaley was the first to take to the podium, and joked that with all the Mayors and Councillors from neighbouring municipalities in the room they could have held an impromptu CRB meeting over lunch. He went on to state that through 2012 and into 2013 Leduc County was "Healthy, optimistic, experiencing growth through partnership, and always open for business!" He shared that in 2012 there was $47.8 million dollars in approved residential development, the Nisku Business Park issued 76 building permits which brought in a staggering $74.2 million dollars, and this year they were expecting to see many of those permits begin construction. Mayor Whaley also spoke of the many ways that Leduc County is involved in our growing community with projects including FCSS, the C-Line Transit route, and many different recreation facilities and amenities. One particular subject he spoke on was the bridges within Leduc County; commenting on how a large number of them are reaching the end of their serviceable and safe lifespans but he was pleased to announce that with the help of some Provincial funding there would be several bridges in the County beginning to undergo upgrades and restructuring this year, ensuring their safety and usability for many more years to come. He noted that business partnerships with entities such as the Nisku Recreation Centre and the EIA, as well as municipal partnerships with communities such as Devon and the City of Leduc are what has helped to make Leduc County such a strong and productive region. Mayor Whaley also took this opportunity to remind everyone that Leduc County was celebrating it's 50th Anniversary this year and invited everyone out to the celebration that would take place on July 26th at the Leduc West Antique Society. He completed his presentation by stating that "The face of agriculture is changing, and the ability to adapt is essential for moving forward." Mayor Whaley retook his seat to a loud round of applause, and then Mayor Krischke was welcomed onto the podium. Mayor Krischke's first words were of praise for his Council. He commented on how it was a pleasure to work with a group of people that worked so well together. His next statement, which he repeated twice, drew a big round of spontaneous applause from the audience when he emphatically said "Leduc is NOT a bedroom community of Edmonton!" And then elaborated by sharing statistics that showed only 30% of Leduc residents travelled into Edmonton for work. He went on to say that demographically Leduc is also becoming a younger community with the average age of our population being 35 years old. The 1.3 billion dollars in growth this region has seen over the last five years is not expected to slow down anytime soon either, with Leduc projected to grow into a city of 67,611 by the year 2032. He continued by informing everyone that one of the ways to reduce the need to raise taxes is diversification. The ideal ratio between residential and commercial is a 60/40 split and Leduc is working toward that goal with a current 70/30 split. Mayor Krischke stated that we also have to "invest in tomorrow", and that is why there is over $14 million dollars slated for Capital Expenditures this year, including projects such as a new spray park, the library expansion, a west end firehall, the Telford Lake Master Plan, and land acquisition. He also spoke of how the City is using certain projects as "placeholders", where the cost is unknown, or when they don't know where the dollars are coming from yet, but knowing that the City will require certain things in the future and the need is there to plan for them. Stressing that partnerships are essential to growth, Mayor Krischke credited Leduc County as being "our most important partner." He gave an example of the C-Line Transit System which is the only transit system in the Province to share both cost and revenue dollars. Stating, "We believe in celebrating our people. Without you, Leduc would not be the success it is today, but there is still a lot of work to be done." Mayor Krischke then brought his speech to a close by announcing that he would be running for Mayor again in the next municipal election being held in October. This news was received by a rousing round of applause as he regained his seat in the audience. This extremely successful Chamber luncheon drew to a close with everyone stuffed full of the fabulous food prepared by the Nisku Inn and Conference Centre, and once again braving the frigid temperatures outside to return to their respective homes and places of business to keep the wheels of progress in Leduc City and County turning smoothly.Leduc County Mayor John Whaley (on left) and Leduc Countty Mayor Greg Krischke both gave very positive updates on the state of their respective areas of governance at the Leduc Regional Chamber Luncheon on January 11th.